I’m fascinated by the word control… The concept itself, and the reasons behind our desire for it intrigues me. I really wonder if control is indeed an illusion. I mean, how much control do we actually have? Emotions and thoughts flutter in and out of our minds constantly – often uninvited it seems. And yes, there is usually a source or a cause, and that can do with some looking into. But in a sense we don’t choose most of the thoughts we have. They simply come naturally, as part of who we are or the experiences we’ve had. We might have a better handle on them than we did before – or so it seems – but many will continue to come and go, day in, day out. Sometimes it can feel you’re imprisoned by them. But I think when someone has genuine control issues, it’s largely stemming from a place of vulnerability. When we feel misunderstood, shut down or ridiculed, it’s human nature to try and claw some power back. Maybe somewhere along the line you lost the control you thought you had – so your intinct is to fight. Or to play with other people’s emotions to make you feel more important and validated. Ever heard the saying ‘God is in control’? It’s a Christian cliche for sure, but it’s something I believe to be true. If we believe the Bible to be real and accurate, God – with all the control and power that is rightfully his – created the world, including you and me. He orchestrated a plan that would see him coming to Earth in the form of his son, Jesus. His son would be born of a virgin, grow up to challenge the status quo through his recorded miracles and teachings, then die a horrible death, taking on the sins of the whole world – including mine – so we could be forgiven. He would rise from the dead to prove he is God, and then return to his father, promising to return for his adopted children one day. And that day is yet to come. His Holy Spirit resides in those who choose to turn from their old life and believe in him, and this Spirit counsels us, leads us, and offers us hope and joy for a wonderful, purpose-filled life in a relationship with him. When we think of control, we might imagine those who have abused and mis-used power, manipulated or coerced. But the only one who truly has the right to be ‘in control’ – and who actually is – hasn’t, and won’t abuse. He is a God of justice, but he doesn’t take pleasure in controlling our lives like a larger-than-life puppeteer. He allows us choices, but he is ultimately in control of the world. It’s a baffling paradox. He could shut Earth down in a day, and has demonstrated his power and supremacy many times – yet he still allows his plans to be worked out in line with his divine purpose and will, through us. He has given us a will to choose him and the lives we lead – yet he is still all-powerful, and works through each and every situation. When we choose him, we are choosing new life – rather than the things that don’t really satisfy. Like the illusion that we are actually in control of our lives. Sure, we’re in control of our choices. But are we actually in control of what happens when we die? We’re not in control of death, no matter how many medical advances we make. We’re not in control of who will choose to love us (though we know God always will). We’re not in control of whether we’ll meet the perfect guy or girl. Whether we will fall pregnant. Or what will happen to our baby once we do. We are not in control of our children’s personalities, though we have control over how we love them. And we’re not in control of who will walk into our lives tomorrow – though we can certainly choose how we will respond to them. Life seems to me like a pendulum of control, and no control at all. God is in control – yes. And he chooses to engage with me and you in the person of Jesus Christ. Jesus is the face of God, “the radiance of God’s glory and the exact representation of his being” (Hebrews 1:3). He is more real to me now than he used to be because I’ve walked many roads with him. And I’ll probably walk many more until I meet him face to face. Meeting him meant that I, in a sense, gave up control of my life, and allowed him to take over. And unlike a dominating parent or a manipulative friend, Jesus walks alongside me, gently guiding me – yes, showing he is in control – but also giving me choices that will ultimately mean my freedom, and the freedom of others. That’s the kind of God I want to serve – always. Very well put. For all of our “education” all our systems, rules and so forth, only God is in control. Great post! I believe that at the core of our journey with God is the ongoing process of surrendering ourselves to His control. And I think most of us struggle to distinguish what we can or cannot control. We have that kind of discussion in our family on a fairly regular basis. “You cannot control _____. But you can control your attitude and how you choose to respond to _____.” Thanks for sharing! Thanks heaps Rick. That sounds like a good discussion to have regularly. Kind of like the Serenity Prayer.. accepting what we cannot change, etc. I agree that it’s pretty central – knowing what to surrender.. how/when to meet God half-way and so on. Thanks for dropping by. That sounds really hard – I’m glad you’re in a healthier place now too, and much more aware of the dangers. Protection is important, as is assertiveness, but control and abuse are never OK.
Just this morning I shared with a friend that if we can’t believe that God is in control of what happens in our lives then why would believe the birth, death and resurrection of Jesus! 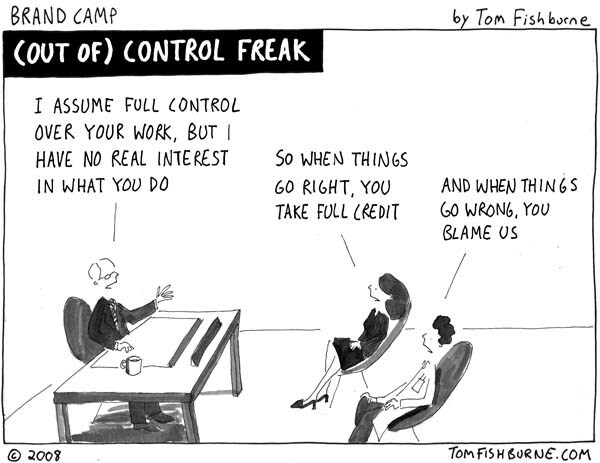 I agree with your thought that control issues can stem from vulnerability. I also like your image of God as in control, but allowing us the freedom to choose. I’ve learned a TON about this topic at Celebrate Recovery over the last two years. It’s been life-changing to uncover the underlying reason I seek control as well as the illusion and lies I believe about myself and God. Check out the codependency pamphlet at HCBC.com/cr or click here: http://www.hcbc.com/index.php/download_file/-/view/44/ . That sounds really interesting – I bet it’s been life-changing. Thanks for the link, I’ll check it out.